For a different type of paddling experience, try one of our stand up paddleboards or body boards. We will even give you a starter lesson in our shop for free! With decades of experience in windsurf and surfboard manufacturing BIC Sport is a pioneer of thermoformed composite construction technology. 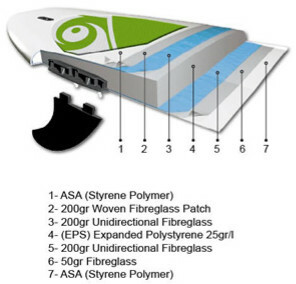 Over the past few years we’ve refined the ideal composite lay-up for SUP, with ACE-TEC as the result. Three sizes suit the needs of experienced riders and newbies alike with a unique combination of durability, light weight and performance shapes. All ACE-TEC boards come standard with the FCS fin system, a premium diamond groove EVA deck pad, ergo-grip carry handle and integrated rail guard. Take the fun from the sandy beach to the surf with the Wave Skater® bodyboard. The patented Wave Skater® one piece, compression molded, closed-cell bodyboard is ultra durable, semi-rigid, and will take an extraordinary amount of pounding without ever delaminating or breaking apart. Handcrafted in Florida. Zap Skimboards is one of the most established and recognizable names in skimboarding, building boards for hundreds of thousands of riders all over the world since 1983. Yet with all of that success we’ve managed to stay grounded. We’re still just a small group of craftsman, artists, and dreamers who handmake every board right here in Venice, Florida.